At the age of eight, Imani Parkinson proclaimed a desire to be an art teacher because they were stylish and made art all day. Today, Imani continues to explore role of diverse representations and narratives in art as a museum educator. 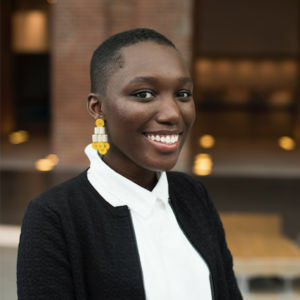 Trained with her Master’s in Museum and Childhood Education from Bank Street College, and a BA in Art History from Purchase College, Imani values the voices, strengths and experiences of the children she engages with. You can find Imani creating new self care rituals, googling what the planets are doing, or running her cats’ Instagram accounts. Imani hopes to make art history fun and accessible to all audiences. Her favorite mediums include collage, paper craft, photography and textiles. Imani is also using writing as a medium to inspire others who create, encourage people to see art, and document her journey as an artist and historian.